Many of you recognized the new item in my mother's kitchen from the first diy. She designed and built a removable table extension for her "dining" bar. To fully appreciate this project, I need to give you a little background. My mother's little barn home doesn't have a lot of square footage. The kitchen also performs triple duty as living and dining room. One of its most prominent features is the simple bar made from a salvaged plank and mismatched vintage brackets. Here are several photos of it from past tours. As much as we love it, my mother is often feeding four extra people: my family. She also loves hosting casual dinners with friends. A bar, facing a wall (no matter how cool that wall is), isn't very conducive to conversation. For the last year and a half we've hauled out a card table and chairs for all of us. It's a lovely wooden set from the 40's, but it's really heavy and a hassle. So my mother has been dreaming... and scheming of a solution that would afford her space most of the time, but seating when needed. She always says "there is a solution to everything". Although I was her soundboard, she really did this one solo, using mostly very inexpensive and accessible materials from a home improvement store. 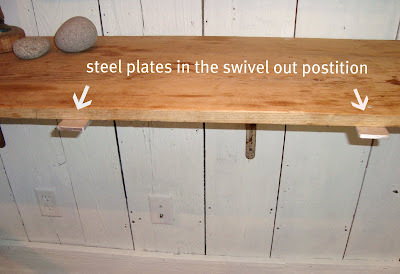 custom metal sliders are permanently attached under the bar to hold the weight of one side of the table. Next to those sliders are large eyehooks. 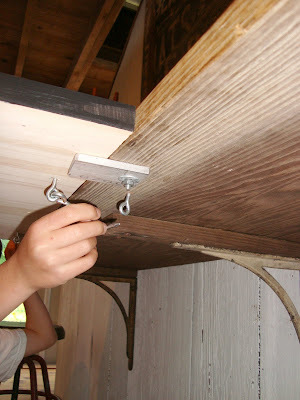 The table top is just a board painted on the top with latch locks attached on the underside that meets the bar. On the opposite side, a flange is bolted in the center. 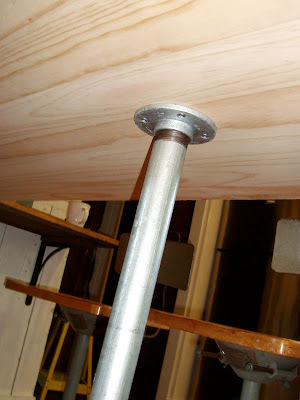 A galvanized pipe screws right in and acts as a table leg. A flange at the bottom stabilizes it. When you want to dismantle it, the leg unscrews and the table stores flat! We've already had some amazing dinners on it... I've even slipped over for a quiet breakfast (above). 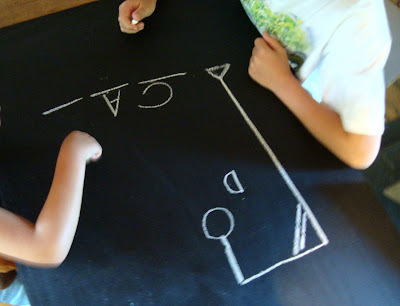 I love the idea of using chalk board paint on the dining table. Please let us know if it holds up well to messy eaters! Sarah, we were worried about greasy fingerprints and spills, but so far so good! oh goodness ~ I LOVE this!!!! great idea. i am a big fan of chalkboard paint- for everything!!! Your mother is a woman after my own heart. There is a solution for everything, you just have to let it percolate around the brain for a while. 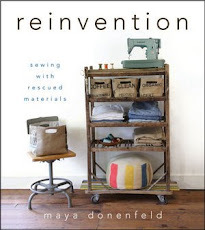 I read somewhere recently that artists are natural problem solvers-it's what they do when they create. And while this makes total sense to me, it was something I'd never really thought about before. Thanks everyone! Goergia- "artists are natural problem solvers-it's what they do when they create". I love that! Yes! you guys are rockstars....plain and simple! What a wonderful solution to a tricky space problem! THanks for sharing. LOVE the lavender heart, too, by the way. Thank you for sharing your life and creative energies. Look forward to your offerings on Bloesem Kids. Great solution. Wonderful ingenuity. The smooth black paint on it looks both simple-functional and industrial-edgy And that quiet breakfast looks pretty awesome, too. awesome cool! 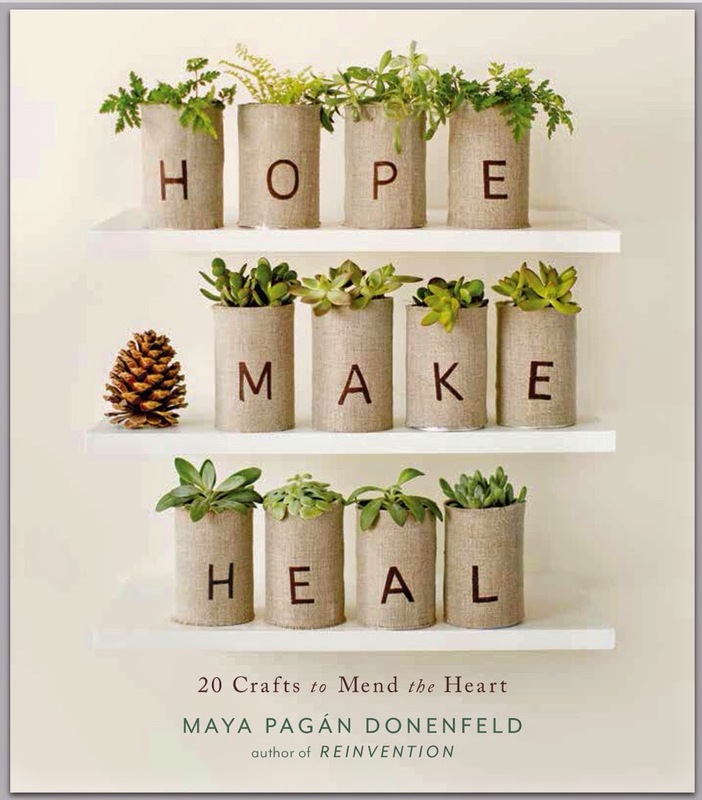 love the little 'nook' created with simple materials. catch up - yes the first day of school is always hardest on us parents. this year my middle child went to kg and my 9 year old started 4th. i even cried for my 9 yr old. what a baby i am! haha. Oh! I love it! I have a kiddie table that I've been planning to sand down & re-stain. This would be SO MUCH BETTER! Thank your mother for such a lovely idea! My kidlets will LOVE IT! That is such a great idea! 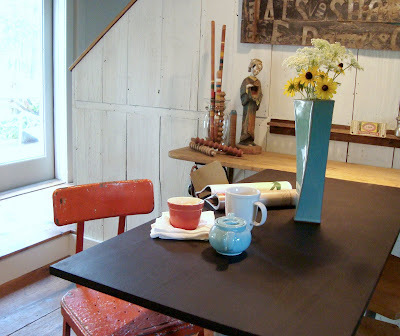 The little dining area is so charming, as are those awesome looking stools. Love it! I have a heavy heart today but your post brought me joy, so thank you for that. 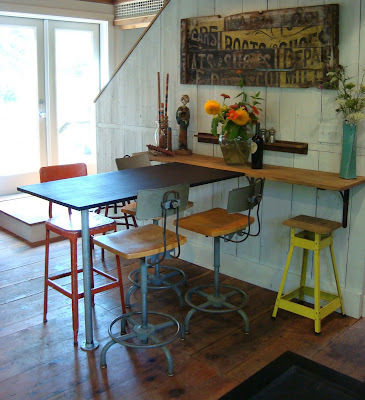 I love your mother's barn -- and the swivel storable bar table is ingenious! The chalkboard paint looks beautiful, and I really appreciate its use as a table-setting makeshift worksheet. This is great! I love how the design of the table is simple and yet versatile! Just perfect!